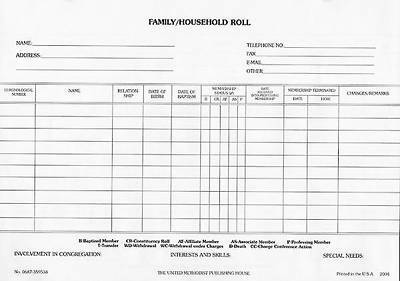 The 8 1/2" x 11” Family Household Roll Sheets may be used instead of the separate rolls to fulfill the requirement for Affiliate/Associate Membership and Constituency Rolls. This is an optional tool to help membership care groups identify families and households within the congregation, and it is useful to those churches that are interested in noting additional information about their members. Sheets are punched to fit the Membership Record Binder, and are printed on acid-free paper; available in packages of 50. Columns are provided for: Name, Relationship, Date of Birth, Date of Baptism, Membership Status (Baptized, Constituency Roll, Affiliate Member, Associate Member, or Professing Member), Date Received into Professing Membership, Membership Terminated (Date/How), Changes/Remarks. 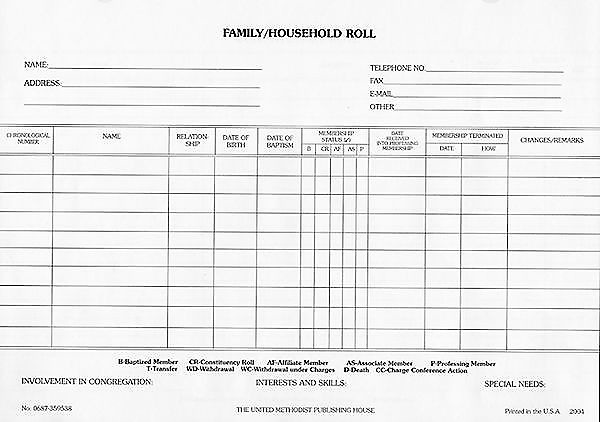 Membership status provides a history of the church relationship of various persons in the family/household, and the information provided by each member in the section on involvement, interests, and special needs (at the bottom of the form) will help the various church committees direct their concerns to the proper persons. Check the Related Products Section below for additional associated United Methodist Church Financial Recordkeeping System products. Check our on-line selection of United Methodist Record System products.